$15 for paperback via Amazon. Jessica Zebrine Gray shares detail about the symbolism of the colors, the stances and objects held by each Tara, and the backgrounds. Prema Dasara writes a foreword and commentary on the 22 major arcana. All 78 cards are given commentary, accompanied by full color illustrations of the cards. The ebook includes an interactive table of contents for easy navigation. (A print version will be available soon). Ebook $10 for the instant download. Purchase here. Tara Wisdom Cards readings are powerful opportunities to gain insight into your current life circumstances. Readings are available in person, online video, or E-mail. A video of a sample reading is available here on YouTube. More information and prices can be found here. Our listing on Amazon needs great reviews. Help share Tara with others! The teachings that inspired these cards came from the Tara Mandala Dance, and Jessica Zebrine is a third-level teacher of these dances. She would love to come to your community to teach Tara and other dharma dances. For an hour-long session, she asks a mere $10 donation per participant (minimum 4 participants) + travel expenses if outside a 20-mile radius of Worcester, Massachusetts. A dance workshop could be combined with a Tara Wisdom Card Party. Day-long and weekend workshops are also available, along with children's workshops based on Tara Tames the Eight Fears. Jessica is willing to travel just about anywhere to teach the dances (as long as the travel expenses are covered). See www.taradhatu.org for more information about the dances. 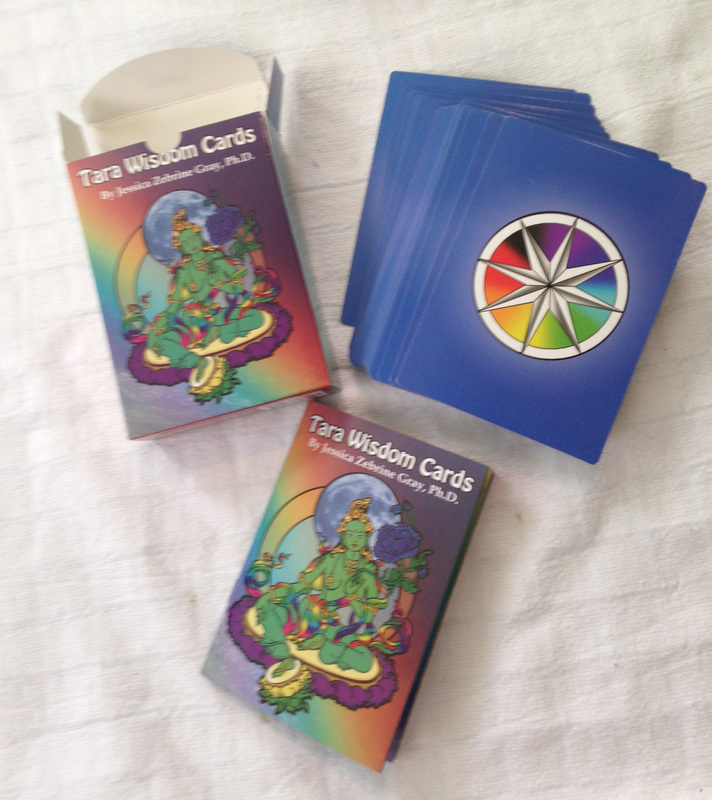 "The Tara Wisdom cards are catalysts, helping to awaken deep insight into the wonder of our day to day opportunities. Combining the symbols of two great mystery schools, the eastern Tibetan Buddhist wisdom of Tara, the Enlightened Feminine, and the western reflection of life’s journey found in the decks of the Tarot, Tara Wisdom Cards are provocative and visionary. Zebrine has made a wonderful contribution to our spiritual development tool kit."